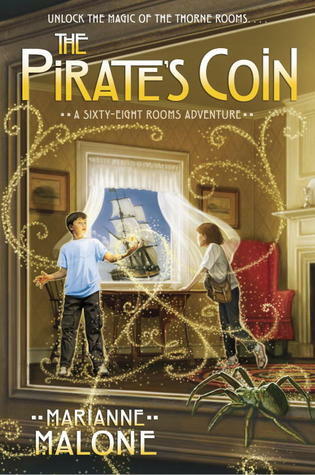 The Sixty-Eight Rooms Adventure series blends multiple topics of fascination to many a reader: miniaturization (think The Borrowers), time travel (think the Magic Tree House), mystery (think Hardy Boys), and secretly trawling a museum behind the scenes (think From the Mixed-Up Files of Mrs. Basil E. Frankweiler). a. Too many paragraphs were spent on the logistics of how main characters Ruthie and Jack got from one location to another. b. There was not very much time travel. c. As a longtime lover of stories about dolls who come alive/tiny people/talking mice /tiny people with tails, I found this book short on encounters with objects/animals that highlighted the size of the shrunken kids in a fun or dramatic way. The scale of a spider and spider web with which Ruthi and Jack had an encounter seemed off to me. d. Finally, I have never shared the fascination our culture has with old timey pirates, (I know–I’m downright un-American), so the pirate theme was not a draw for me. a. The book touched on slavery, in an age-appropriate way. b. Jack and Ruthie have a great friendship. c. Ruthie and Jack try to help people and make the world a better place. d. The book is enlivened with many warm drawings. Here is a Huffington Post article about the Thorne rooms which includes some of Malone’s thoughts about the exhibit. This entry was posted in Book reviews and tagged kids' time travel stories, Marianne Malone, middle grade fiction, Sixty-Eight Room Adventure, Thorne Rooms, time travel books for children. Bookmark the permalink. Like you, I loved the first book in the series and someday I’ll visit the Thorne rooms. I’ve always been fascinated by dollhouses and tiny people (The Borrowers) or mice who talk (Miss Bianca). Interesting that this third volume didn’t impress you as much as the first. Thanks for your honest review!